Exclusive forged aluminum Axle-Runner mounts mount to your quick release skewer, and "creates" eyelets that you can mount mudguards to. Hi, I'm trying to find the new type of front fork attachments /mounts as this old type axle mounted eyelets do not fit properly into fork's wheel axle mounts on both of my 26" MTBs (Specialized and Viking). They're simply not shaped correctly thus making axle's securing threaded cap being slighly skewed instead of being at a 90 degree like they are without Axiom eyelets adapters installed. This is making me feel uncomfortable to ride as it could lead to a potential axle snap/damage subsequently loss of the front wheel = accident. I can't find anywhere to buy separately the new attachments that replace these so am going to try with a 30m p-clips that attach directly to fork arms. I spent years bodging mudguard stays to my front forks with cable ties and putting up with them rattling and flapping around. I wish I'd known about these years ago. Took five minutes to fix on and work perfectly. Is there a 10mm through axel product available. You will need a different style of mudguard fitting, this will depend on which bike you have. Please get in contact with our sales team. What Is The Length Of These Axle Runners. Measured from the centre of the two holes these axle runners are 23mm in length. Are The Axel Runners Compatible With 2014 Specialised Roubaix? As we have never sold your bike, nor had one in here to test it with we will have no way of knowing for sure, but from images online and the fact your bike uses a standard QR rear wheel you should be absolutely fine to use these. Can I Fit These On Allen Bolt Skewers Too? i.e. not QR skewers. Also, will they fit a carbon front fork where the skewer dropouts are slightly recessed? 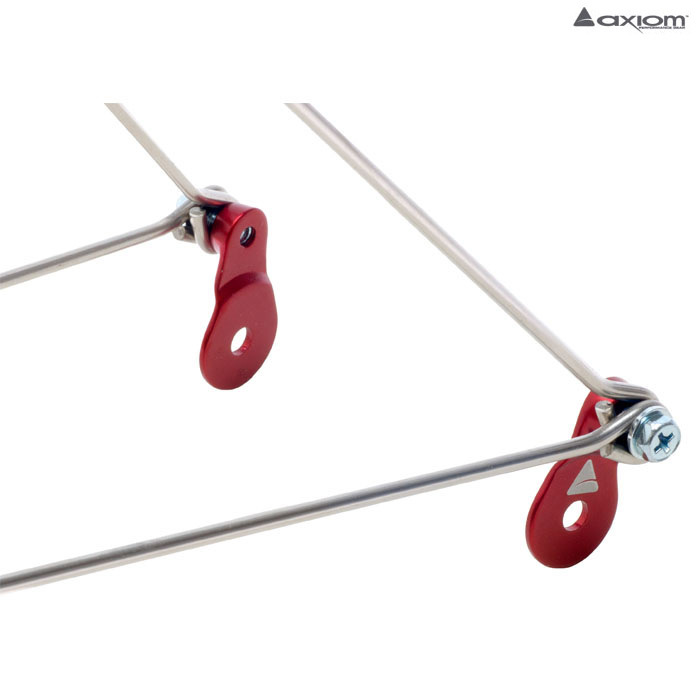 These should be compatible with allen key skewers, they may be compatible as well with forks that have slightly recessed dropouts but this would depend completely on the fork design. I am trying to fit mudguards to a carbon fork with disc brake. Even if i do use the axle runner mounts, it will still not be easy to bend the stay around the disc caliper to reach the mount, so at this point, i am not sure that axle runner mounts will work. Anyway, given that it is just the front that i need mounts for, i am wondering if i can buy 2 mounts insted of 4. Otherwise, it cud be a rather expensive waste of money! These are only available as a set of 4 I'm afraid. Can you tell me the size of the hole in the red mounting plates at the other end to which the mudguard stays are fitted in the web page illustration. Are they sized for a standard threaded wheel axle? I'm trying to fit a pair of SKS longboard mudguards to a Pashley Guvnor, a task which I didn't expect to be easy. The rear guards fixings are ok as the Guvnor frame does have suitable mounting points. However, the second hole at the end of the front fork above the axle nut isn't so well positioned. The Axiom runners, if they go on the wheel axle, look like they'll allow the stays to be connected just back from the axle (as opposed to above). Many thanks in anticipation of your response. The non-threaded hole designed to fit over quick release skewers is 6mm in diameter and the threaded hole is designed to take standard M5 (5mm) threaded bolts. These axle runners should solve the issues you're having.